The Set-up: Ina is writing an article about cooking with her three favorite green herbs: basil, chives, and parsley. 1:12 – First recipe up: Cream of Fresh Tomato Soup which Ina says is a “classic culinary combination” tomatoes & basil. 2:46 – In this soup, Ina is using red onion and carrots with tops because their sweetness will emphasize the sweetness of the tomatoes. 3:25 – I’m noticing here that Ina isn’t de-seeding her tomatoes, just dicing them as-is – I wonder if it makes a difference…? 4:03 – Oooh, nice - this is a 2 for 1 soup that can be served either hot or cold. 5:22 – Now Ina is giving us a run-down of some of her other favorite basil-centric dishes: caprese salad, green goddess dressing, roasted pepper & goat cheese sandwiches, under the skin of a roasted chicken breast, or even as a table decoration. 6:17 – Now onto the processing, uh, process, compliments of the food mill. It seems to filter out some of the tomato skins and other fibrous parts, so maybe that’s why she didn’t bother to de-seed the tomatoes earlier. 7:45 – Soup’s on! We get a quick julienning lesson and then Ina plates her soup. [cooking nerd alert] I hate to be a stickler for accuracy, but what she actually demonstrated is chiffonade. 11:18 – We’re back in the garden to raid the chive border and Ina reminisces about her grandmother making chive cream cheese. Mmmm. 12:30 – Now on to the Chive Risotto Cakes which I am excited to see prepared. So far so good – chives, greek yogurt, Italian fontina. 13:50 – This is the tricky part in my mind: the risotto. Even after making it twice (here and here) I’m still a little nervous about it. 14:01 – The risotto has been mixed into the cheese and it kinda reminds me of a rice casserole, which sounds like I’m being mean, but I swear it’s more of a reassuring feeling. 15:36 – The risotto cakes have chilled for a few hours and now Ina is forming the cakes and coating them in panko for frying. 19:42 – I just realized that these risotto cakes are pretty close to an arancini, just without the filling. A gateway rice ball if you will. 20:15 – Ina and I have the same approach to meals – don’t know what else to serve with something? How about salad leaves with vinaigrette? 21:20 Ina’s friend Cathy arrives right on cue to taste test the risotto cakes, excellent timing because they look so good. 22:53 – Now we’re on a little field trip to see an herb garden that Cathy helped design(?) plant(?) which gives the two ladies a chance to brainstorm all the ways Ina uses fresh herbs. 23:29 – I assume Cathy has permission to raid the garden for parsley, because she hands a huge bunch to Ina for her Pasta with Pecorino and Pepper recipe right before they leave. Run! 26:13 – Ina is full of tongue twisters today: Pasta with Pecorino and Pepper (and parsley.) She says parsley is the unsung hero of the herb garden, which seems about right. 27:34 – Ina is all about the hard Italian cheeses today, first Fontina, now Pecorino. 28:48 – The pasta is done cooking and now Ina is maling the sauce right in the pot – cream, butter, halved cherry tomatoes, parsley (! ), pepper, and a big handful of pecorino. 29:56 – Ina finishes up her article over a bowl of pasta and compares it to completing a homework assignment, but getting to eat the research. I have a hard time narrowing down my favorite herbs – rosemary, thyme, tarragon – they’re all so good! Using fresh herbs is such an easy way to elevate your cooking, Ina’s right when she says they have much better flavor than the dried versions. Question: what would Ina say if I just “borrowed” and handful or two of her basil. NBD, right? 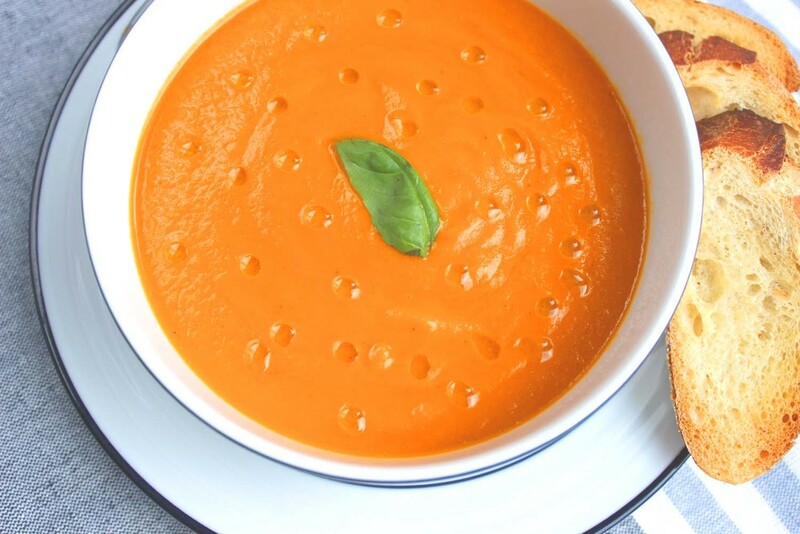 Cream of Fresh Tomato Soup is really an easy recipe - the main skills you’ll need are chopping the tomatoes and the vegetables, and measuring the seasonings. I used Roma tomatoes, sometimes called plum tomatoes, and de-seeded them before chopping. It’s kind of a messy job, but as Ina always says, “clean hands are a cook’s best tool,” so I quartered them length-wise then ran my index finger along the ribs to scoop out the seeds. Our blender can definitely handle them and pretty much anything else we throw at it, but for some reason I prefer to leave them out. I know I’ve mentioned before that I find vegetable prep meditative, so I tend to take my time when I’m cutting produce, usually because I’m being overly attentive to keeping the sizes consistent. This is a great recipe to practice with – large dice (tomatoes & carrots), small dice (red onion), mince (garlic), chiffonade (basil). It will be helpful to your cooking in general, but with this recipe in particular it’s not such a big deal because eventually everything will be pureed anyway. Yes, assuming you have access to blender, immersion blender, or food mill. I used a high-powered blender, a 5 qt. French oven, medium mixing bowl (for prep and during the blending process), a medium cutting board, a chef’s knife, a liquid measuring cup, measuring spoons, a wooden spatula and a rubber spatula. Cream of Fresh Tomato Soup will make you question everything you thought you knew about tomato soup. 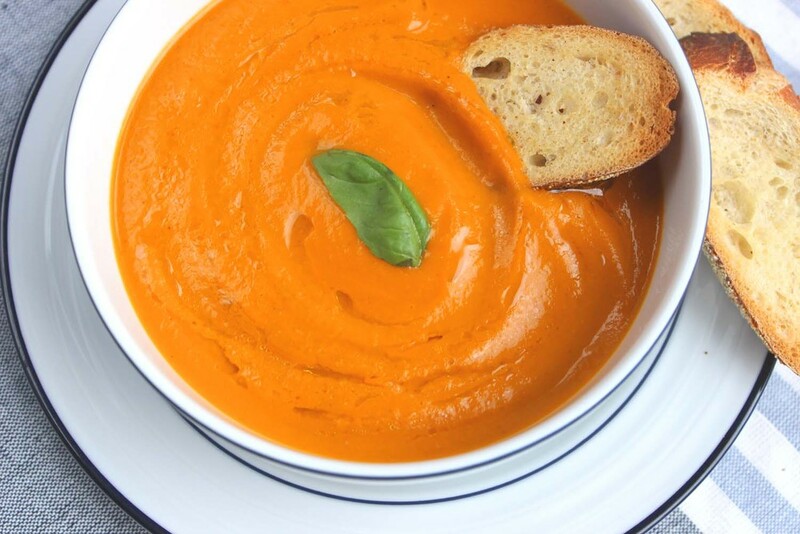 Okay, so maybe that’s a little dramatic and this might seem like a lot of effort, but imagine making a beautifully smooth restaurant-quality soup that has deep tomato flavor. It’s such a great recipe for chilly winter days, but still light enough for warmer months. I love serving this with a simple garnish of olive oil and basil and accompany it with crostini or a toasty grilled cheese. Yum!